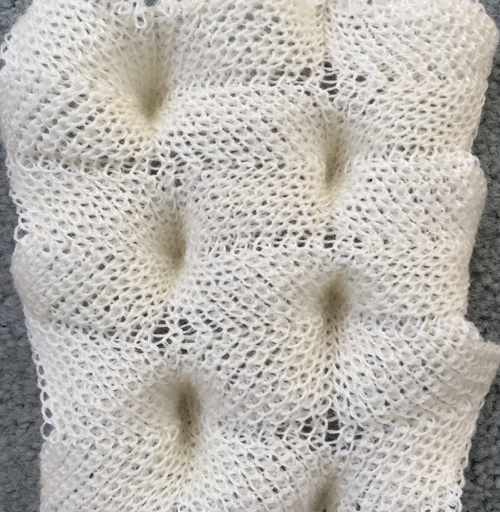 After a complicated nearly 3 months I am returning to some knitting, and am sharing some of my results once again. 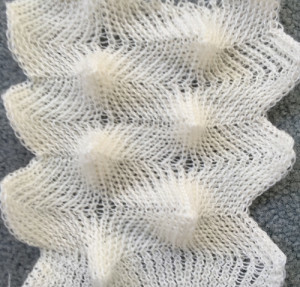 I have always found 2 or more color patterned brioche stitches executed in hand knitting as inspiring and complex challenges to admire, but am not tempted to actually attempt to execute them in any way. Each of the 2 colors tucks for 2 rows and in turn knits for 2 rows alternately. 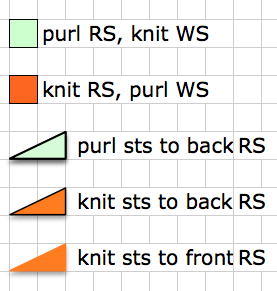 Settings are changed manually as shown below after every 2 rows knit, following each color change on the left. 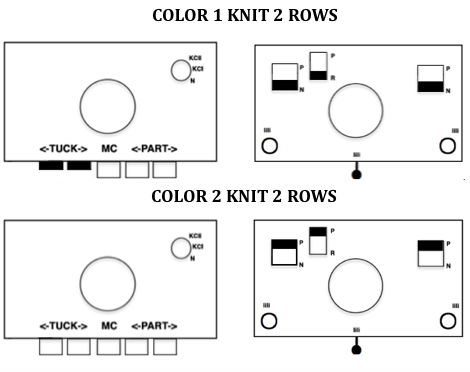 Making things a little easier: the top bed may be programmed on any machine, including punchcard models to avoid cam button changes in the knit carriage every 2 rows. 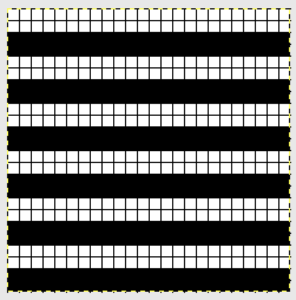 With the main bed set to tuck <– —> throughout, black squares will knit for 2 rows, white squares will tuck. First preselection row is toward the color changer. 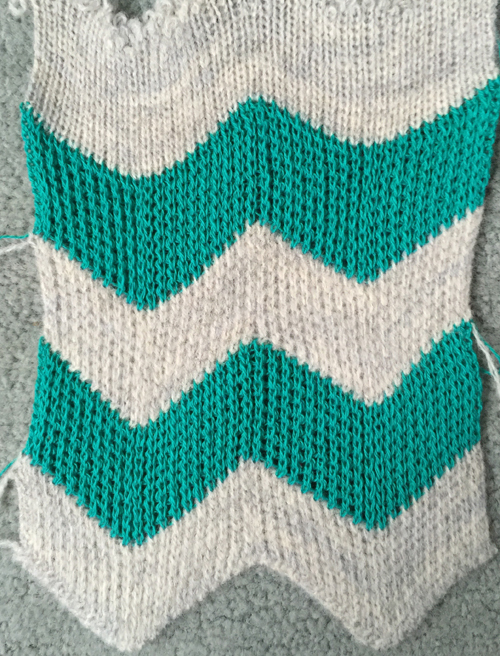 When no needles are selected on the top bed (white squares), ribber is set to knit. Top bed will tuck every needle. 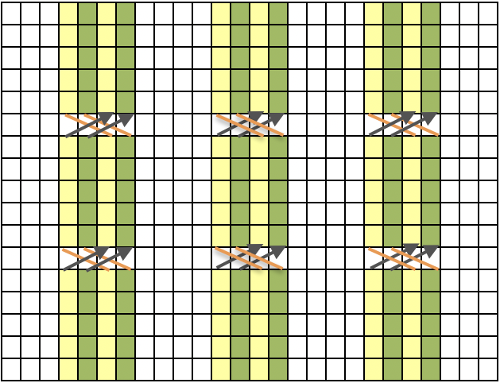 When needles are selected on the top bed (black squares), the ribber is set to tuck in both directions. The ribber will tuck on every needle. 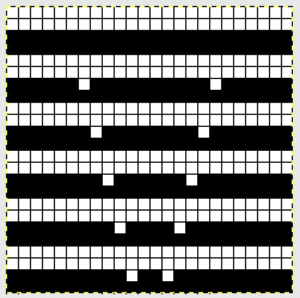 On any knitting machine with every other punched hole, black squares or pixels locked on a single row, id the pattern is knit in FI, continuous columns of vertical color are created. 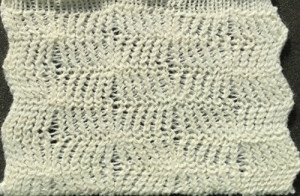 Tuck stitches widen the fabric. 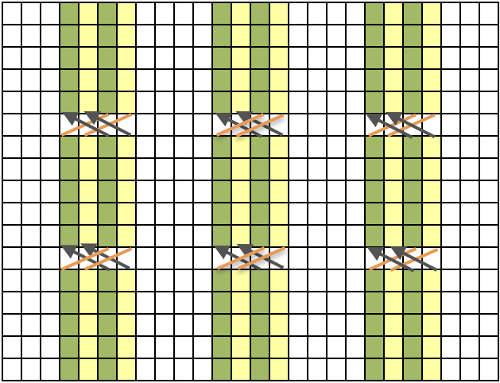 As a result, the tucked knitting in this chart on the ribber (represented by the color yellow), forces the space between the knit stitches produced on the main bed (represented by the color green) apart, while stitches tucked on the ribber will create the gap between the stitches knit on the ribber, appearing on the reverse side of the fabric. The combinations create the appearance of single stitch vertical stripes. Every needle ribs are generally knit at tighter tensions than when the same yarn is knit single bed. 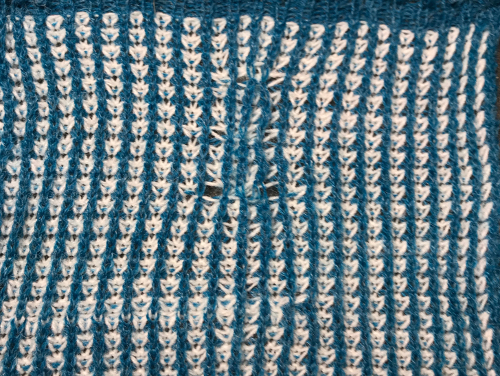 Too loose a tension in any tuck fabric causes problems with loops forming or knitting off properly, too tight will produce stitches that do not knit off properly. 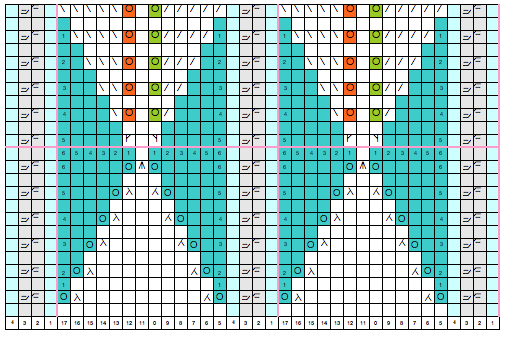 One limitation of crossing stitches here is the actual stitch size, which needs to be constrained to produce the fabric. 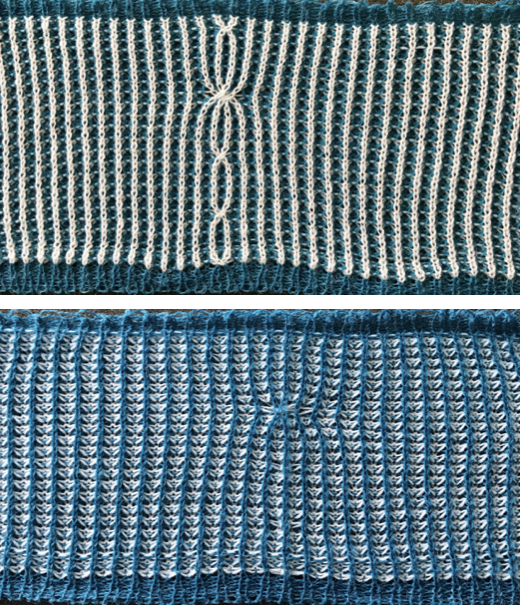 Tiny stitches need to travel across fixed space. 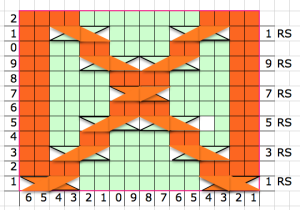 One by one crossing is manageable, 2 by 2 requires extra slack to make the transfers possible. 3: white tuck loops ( I chose center 3) are lifted up and off their respective needles and allowed to drop between the beds. 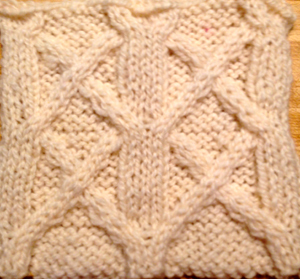 This will allow the 4 white cable crossing stitches to have more slack. With some planning on longer pattern repeats it is possible to plan added clues to tracking rows on which the cables occur, and their location on the needle bed. Repeats with very few marked areas merit testing in tile as any other repeat. 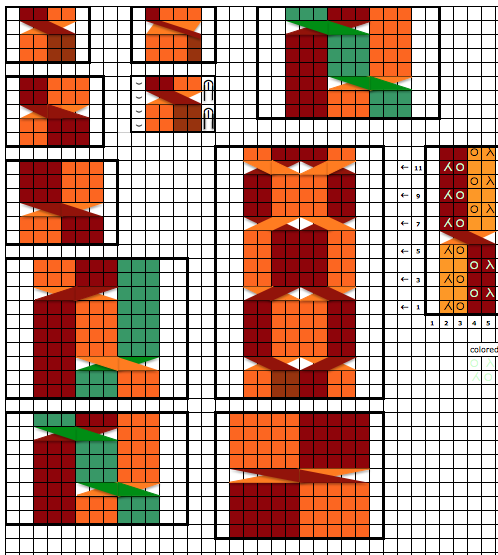 The repeat on the left when tiled shows the area of a patterning error, on the right with the missing blank rows added the problem is shown to be resolved. 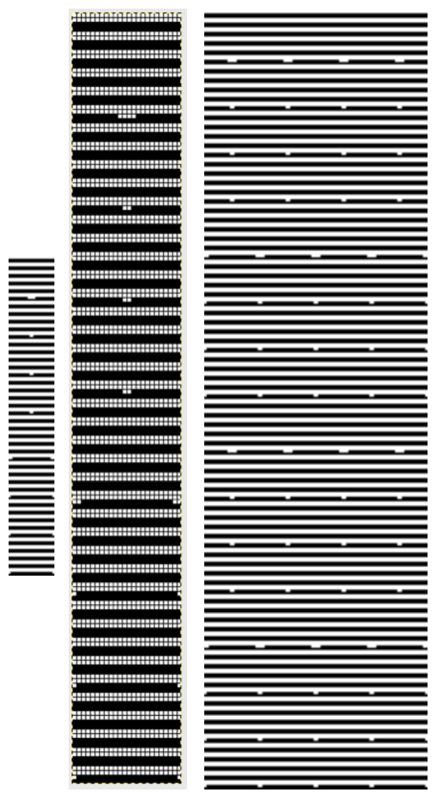 A proof of concept swatch: Planning for all over brick layout of corrected repeat: More detailed charts of the 2 repeats, suitable for punchcard machines, editable further for use in electronics. 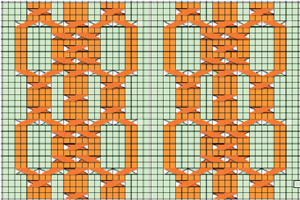 Ayab knitters need to repeat the final motif across the width of the download to match the number of pixels to the number of stitches in use across the needle bed, use single setting. Once on position 4, the red arrow indicates the direction in which the bed was racked on the last move (R), the “empty” arrow the direction for the next move (L), bringing position back to 5. 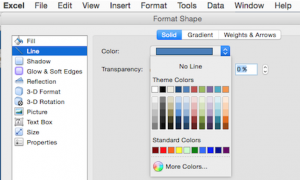 More complex patterns require a bit more planning and tracking to avoid errors. 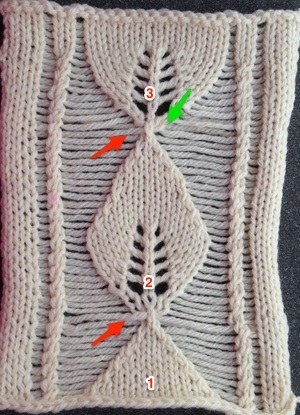 Racking patterns in books often recommend beginning fabric with the setting on 5, or the center position for the machine in question. 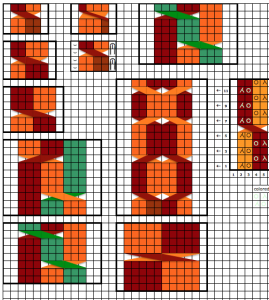 Doing so allows for balanced edges in patterns that swing by multiple positions in both directions. In this instance, for the sake of avoiding mistakes in as many ways as possible, I would start the pattern on racking position 10. Racking cannot go any further to the right, so no chance for example of racking to 6 rather than 4 in the knitting because of inattention. 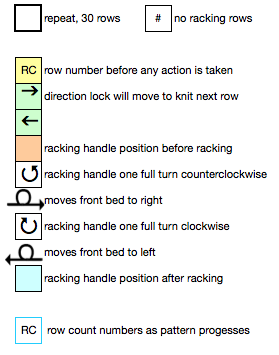 Having a “cheat sheet” with row numbers where no racking occurs, and position of the carriage to R or L at their start and or after knitting is also helpful. I had to lower the tension on both beds considerably to avoid forming loops that in turn got hung up on gate pegs. Especially at the start make certain that the comb and weights drop properly. 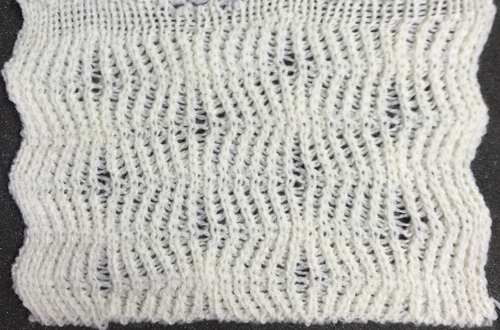 Using KCI will insure that the first and last stitch on the main bed are always knit. 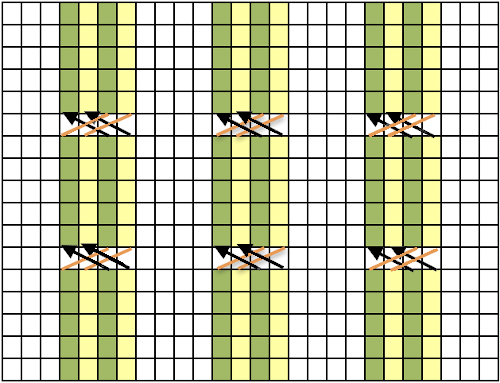 In the patterning used on the Passap back bed (previous post), the groups of needles in each half of the repeat will change to the alternate position with each pass of the lock. 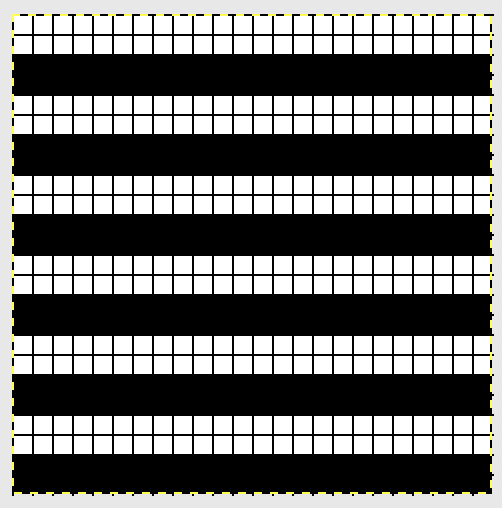 On the rows where the back lock is changed to N, selection continues in pattern, but no tucking occurs. 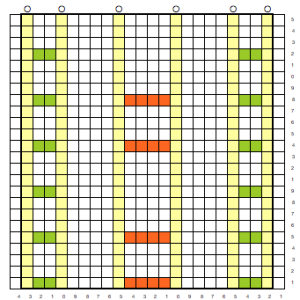 In this chart the pattern is maintained continuous throughout, while blank “remaining” squares are filled in on rows where no tucking or racking occurs = N, every needle knits. In Brother machines both tuck buttons are pushed in. Selected needles knit, non selected tuck across the row. 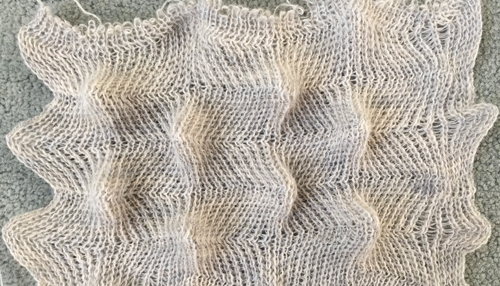 I tested the pattern approach on my 910, with a 38 row, 20 stitch repeat in a random acrylic. I had some issue with some needles not selecting properly, for whatever reason. 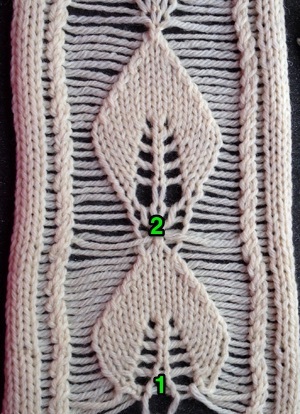 The repeat was not planned so a full 10 stitches were at each side of the knit, resulting in the difference on the right side of the swatch photo from its left. 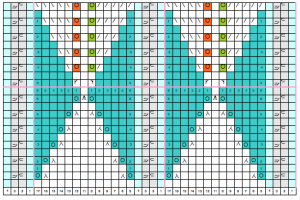 Overall, wider repeats and thicker yarns gave me harder to knit fabric, with less noticeable pockets and lack of stretch and “bounce”; ultimately I went back to a 6X6, 12 stitch 2 row sequences illustrated in the chart above. The thinner yarn needs to be with a bit of stretch, and enough strength not to break when ribbed and racked at the tightest possible tension. This is a fabric that requires concentration, having as many clues as possible to help stay on track is useful. If errors are made close enough to the all knit row, it is possible to unravel carefully to that point, and continue on. 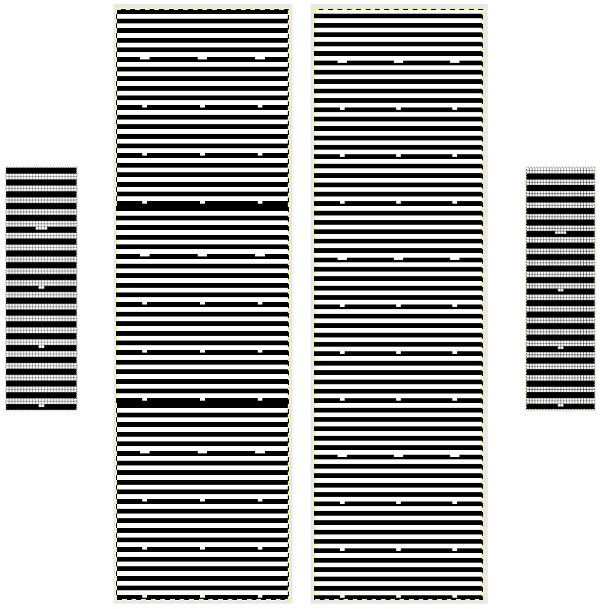 Mylars or punchcards may be marked to reflect racking position. Here the mark on the right = 10, the one on the left = 9. Marks take into consideration that the card reader’ design row and knitter’s eye level row views are not the same. 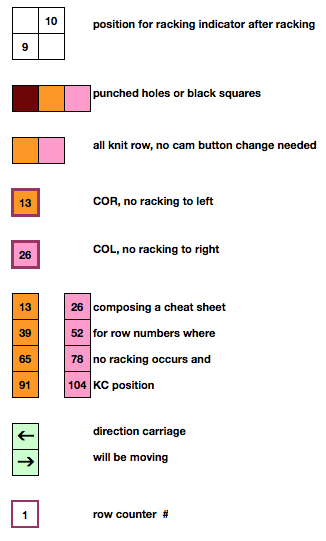 A row cheat sheet can help track carriage location for all knit rows. Pictured below is part of mine. 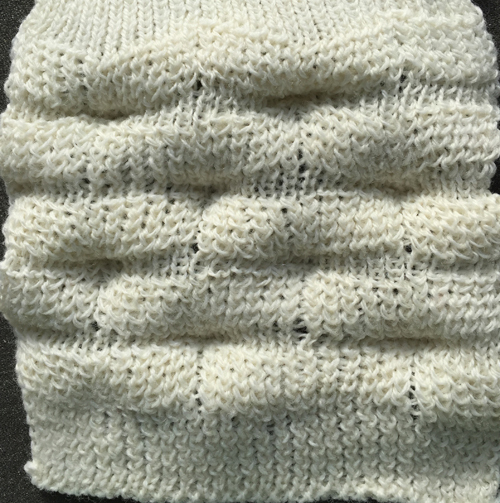 Wording for clues or description of sequences should make sense to the person knitting, not necessarily follow a specific formula. it is a matter of personal preference whether the extra effort with full fisherman rib is worth any difference in appearance or result in the final fabrics. Changes in tension, yarn fiber content, and machines used add to the variables. Good notes in trials help one determine predictable results and to choose whether the effort may be worth it or not. 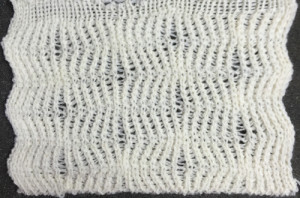 Using laborious techniques for borders rather than whole items is always an option. A “how might this be done challenge” of late re this fabric brought to mind racked patterns for chevrons, both vertical and horizontal, and possibility of producing them on home knitting machines. 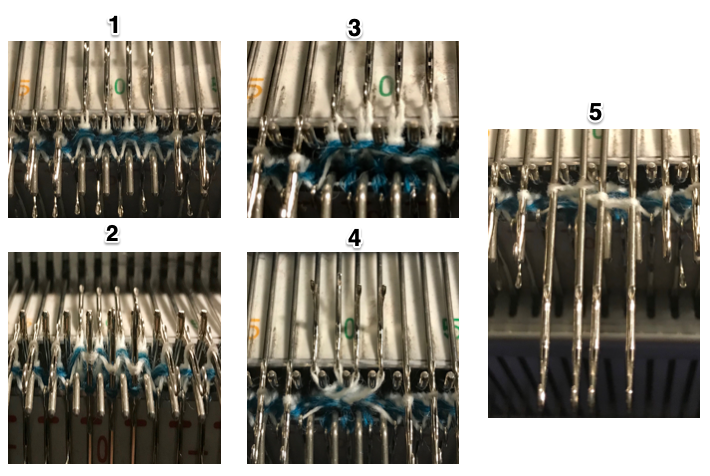 To review some of the principles in racking in both Brother and Passap knitting machines: pitch is the distance between each needle groove along the needle bed, is sometimes also referred to as gauge. The size varies between machine brands and type of machines. For example, the Brother bulky has a 9 mm pitch, the Passap a 5 mm one; the larger the pitch number, the thicker the yarn that may be used. Full pitch lines up needles, and gate begs (or channels) on both beds directly opposite each other. 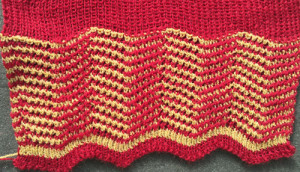 To knit patterns in full pitch, the rule is that for every needle in working position on the main bed, the corresponding needle on the opposite bed must be out of work, and vice versa. This setting is never used when groups of all needles are in work on both beds. 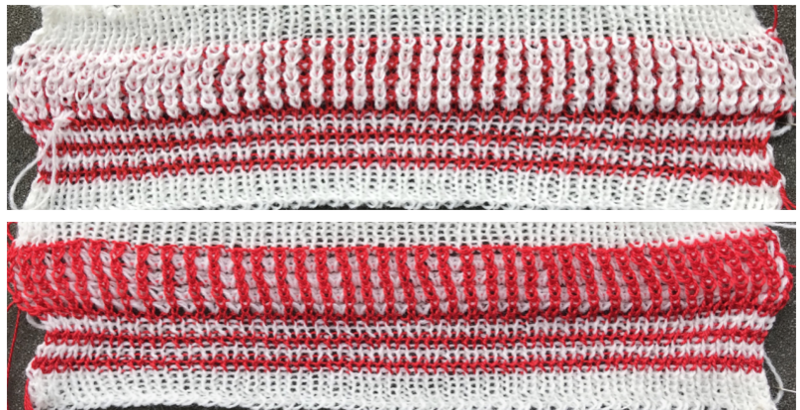 Stitch patterns using this setting are designed to have opposite needles in work on either bed at any one time, but not both at once. The number of maximum needles in use for ribs on both beds will usually total 200 (4.5 mm machines), and the setting accommodates yarns thicker than when every needle is in use. In half pitch both bed needles are now offset by half a position, centering them between each other. The full complement of needles for possible use now is potentially 400 (4.5 mm machines); the setting accommodates thinner yarns than one might use single bed. 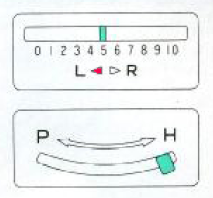 The half pitch lever on Brother may be moved from P to H to change alignments. In Passap the racking handle may be used in up or down position to do so. The racking or swing lever allows the ribber bed to be swung one full pitch to the right or to the left in a series of stepped moves. The racking handle on Brother machines is located on the left hand side of the ribber bed. Racking swing indicator positions are numbered 0-10. When the racking indicator has been moved over to the next number, this means the ribber has moved by one full pitch. 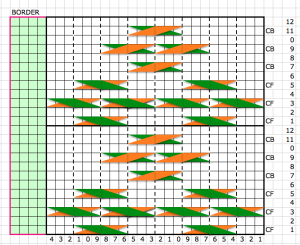 With the swing indicator at 5 both beds will be centered opposite each other, the usual position. 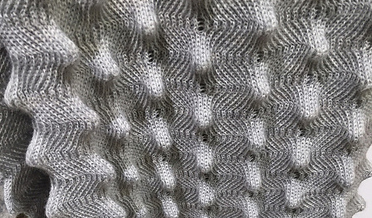 Starting points may vary when racking is used in pattern. Beds cannot be racked with needles in holding, as needles will then crash into each other. It is always a good idea to check ribber alignment before tackling more complex, double bed fabrics. In Passap the racking indicator is situated above the racking handle, and arrows indicate the direction of the last movement. The scale at the top of the front bed shows the possible racking movements from a center point of 0 to 3 to either to right or left of center. I chose to place numbers below the factory ones on machine from 0 to 7, finding that method easier to follow, since I do not rely on built in patterns and racking prompts from the console. For the purposes of these swatches I am reverting to the factory indicators. In Passap system the racking handle has 2 main positions: up, and down. When the racking handle is up needles are directly opposite each other (P pitch in Brother), when it is down the needles are between each other on opposing beds (H on Brother). There are some racking handle positions at different parts of the “clock” that are recommended when using some of the Passap accessories. Regardless of machine brand needles have 3 basic functions: knit, slip (do not knit), tuck (gather loops). Passap pushers have 3 positions: work, rest, and out of work. When a pusher is in the up position the corresponding needle will knit no matter what the setting on the pattern dial. This is the equivalent of having needle pre selection on Brother, but forgetting to change cam buttons from normal knit setting. When a pusher is in rest it will slip or tuck depending on lock setting to AX, DX, or FX (in Brother these would be needles not selected, in B position). 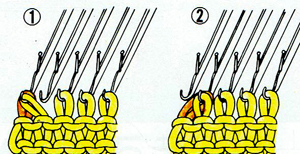 If locks are set to C, E, or G, the pushers have no effect on the needles. Pusher positions may be changed manually, automatically by arrow keys (back lock Passap, lili buttons and levers Brother ribber), automatically by readers whether electronic or punchcard on both brands in the Brother main bed or front bed Passap are in use. 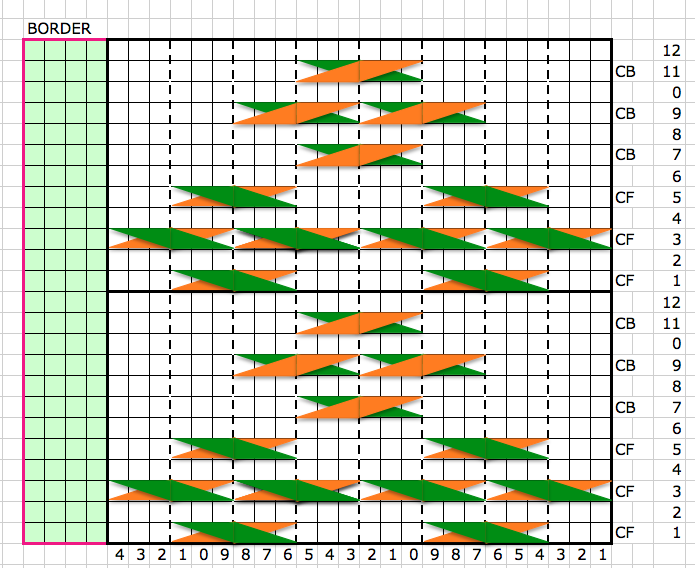 NO pushers are used in : N (double or single bed plain knit), CX (tubular), EX (double bed, tuck). I personally find racking easier in terms of the numbering in Brother brand machines. For these samples however, I chose to work on my E 6000. Adding tuck to the mix creates more textured surfaces, and half or full fisherman’s rib where every needle tucks, then knits as the carriage reverses direction on either single or both beds, is a place to start. 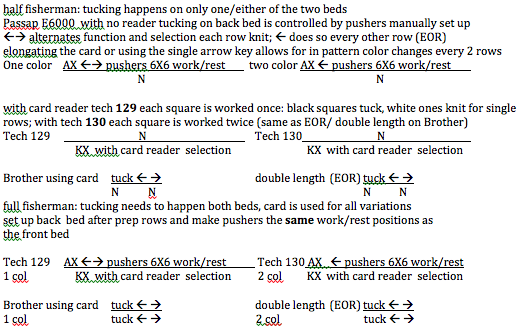 I have written previously on tracking brother racking sequences using a punchcard numbering system. If no other pattern is used on the main or front beds, needle and pusher selection might be used to track racking position there as well. These fabrics require concentration. In terms of chevrons, both horizontal and vertical may be produced. 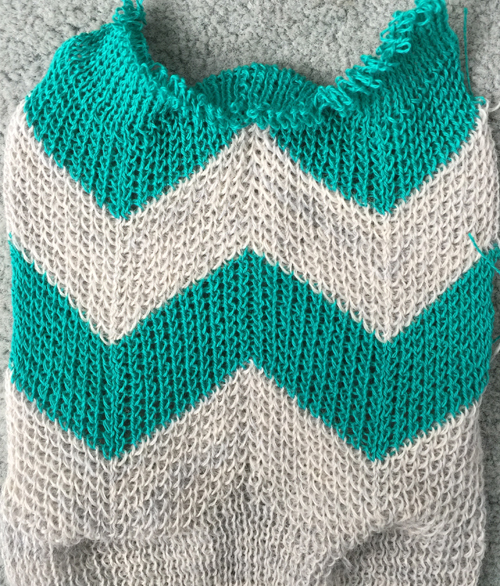 Some published sources include a youtube video by Diana Sullivan, knit on a Japanese machine, and a baby blanket in full fisherman rib knit on the Duo 80. The version below is my half fisherman adaptation of the latter. The photos illustrate both sides of fabric. The racking is done by moving single of each of only 2 positions to the right or to the left. 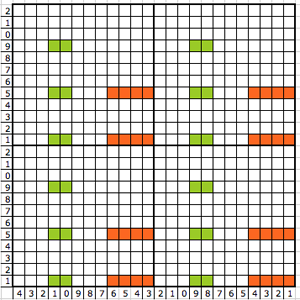 Single (or multiple, odd numbered) rows at the end of each sequence place the carriage at its start on the opposite side, rather than altering the numbered sequences as in the Diana video. I began my fabric on Passap racking position 2, to the right of 0, locks set at KX, N, first and last needle in work on the front bed. 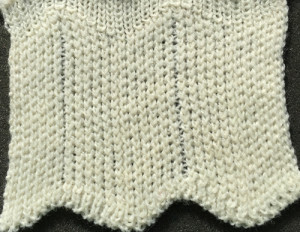 Back bed tucks every needle right to left, knits them left to right. 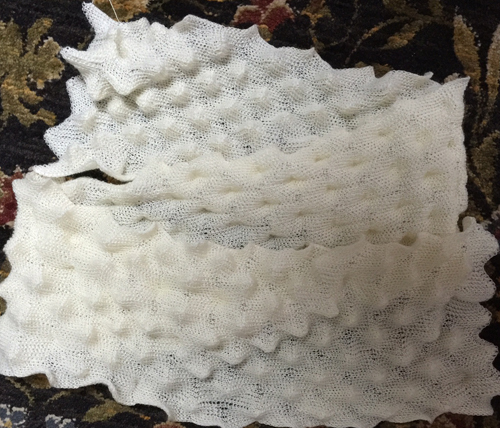 There is a slight difference in texture between the 2 sides of the fabric. Just about 2 years ago, I had an obsession with leaf shapes in lace, and wrote a series of posts on approaches to both designing them and rendering them in knit on more than one machine. One such early post. 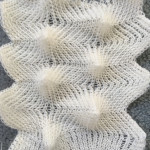 Recent publications are reflecting the increasing interest in bulkier knits and combining ladder “lace (created by needles remaining out of work) with shapes floating within the resulting open spaces. I thought I would address some of the issues in such fabrics, while returning to a leaf as the focus “shape”. My samples are knit on a Brother 260, using hand techniques that require only the basic set of transfer tools. 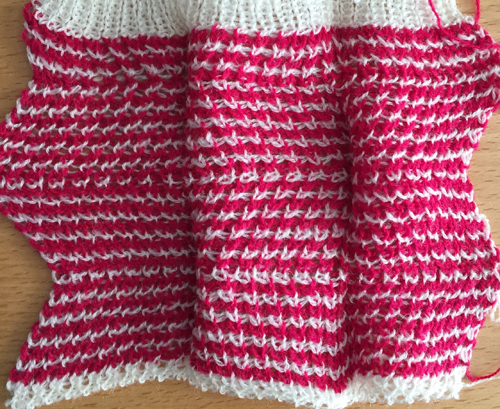 Long verticals in knit may have problems with the edge stitches separating from the rest of the knit, i.e. in FI vertical stripes. 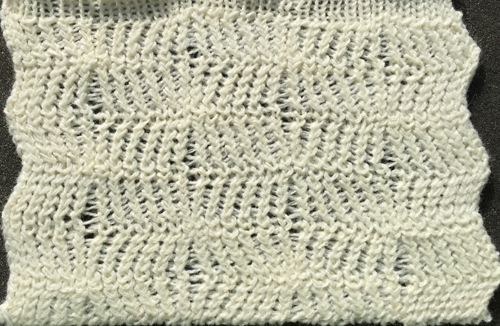 In plain knit, the edge stitches may stretch, become distorted, and may encroach on the ladder space. A series of actions taken on the edge stitches of ladders will help prevent that, here I am choosing to use a simple 1 X 1 cable cross every 2 rows to stabilize them. Having the cables coincide with the rows on which transfers are made to create the chosen shape makes tracking them easier. I will document the 1X3 increase method I liked best out of several trials in my next post. Keeping crossings all in the same direction and having ladders to mark vertical placements makes the process far easier. 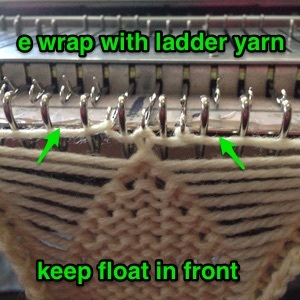 The stitches on either side of the cable may be knit, dropped every X# of rows and latched up to create a purl ridge on either side of the cable, at times there is enough slack in the ladder created to achieve the same. 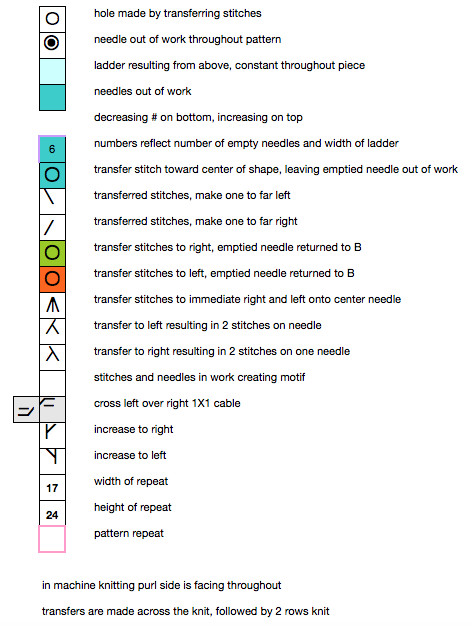 End needle selection needs to be cancelled (KCII) in any pattern with needles out of work. 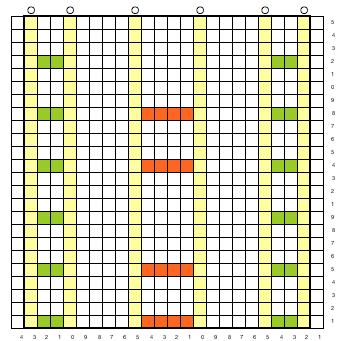 In simple patterns using selection to keep track, ladders are not needed to stay in a clear vertical. 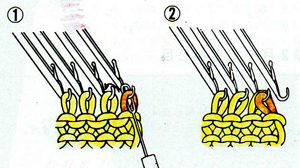 If using the ribber, stitches marked for “ladders” may actually be transferred to the ribber to create the purl ridges on either side of the cables and twists. 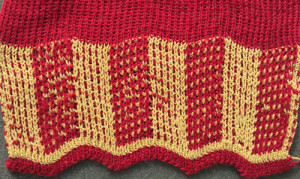 Fair isle, like any slip stitch fabric is “shorter and skinnier” than any produced using the same yarn colors in plain knitting, single bed. Cables also narrow the fabric considerably. 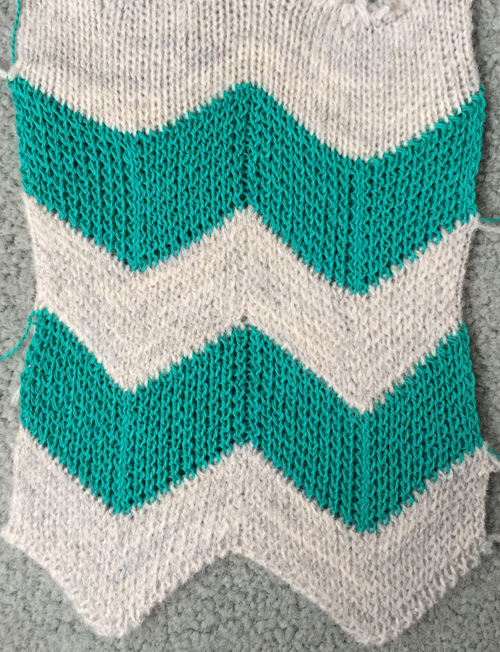 Begin with tension set at least 1-2 numbers looser than usual, and make tension swatches large enough to include all cable variations. 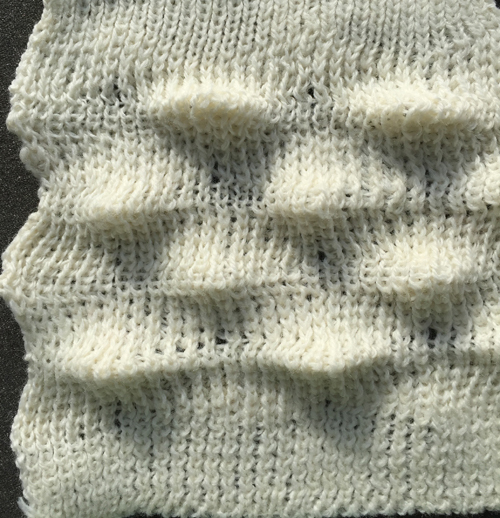 After the cable crossings, be sure to return the needles to correct pattern selection before knitting the next row. 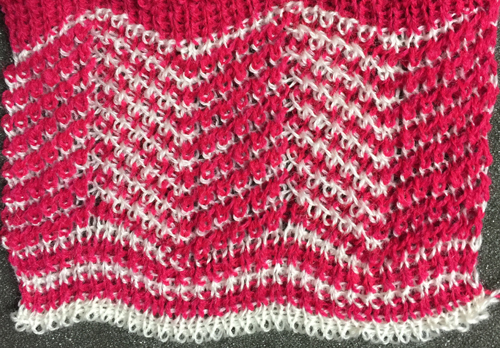 Do not pull the whole group out to holding (E), as the whole group will then knit the color in the B feeder, and you will have a striped “mistake” on the next row knit. Leaving any needles OOW in the knit will select the needle on each side of the ladder to come forward, knitting the color in the B feeder. This may not work for you in terms of how the motif is affected by the vertical line created. 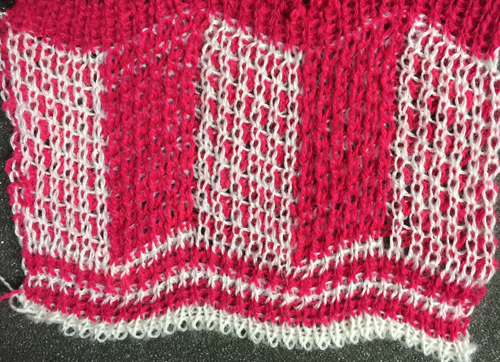 If ladders are required, the vertical line in the B color may be eliminated by canceling end needle selection (KC II), or by dropping those stitches before you cable (which will give you a bit extra yarn for those crossed stitches). Ladders may be also latched up is you like, but watch where those floats are going in the fabric. Making your own cards: try to control the length of the floats. Pre punched cards with lots of punched holes can produce areas to be cabled by selectively masking areas with tape (both sides of cards). Conversely, you may punch diamonds, squares, etc. in the center of other shapes that would normally have floats too long for FI, to produce a B feeder color area for cabling. Like color, most often, needs to land on like color, so stitches need to move further than they would in a one color knit. 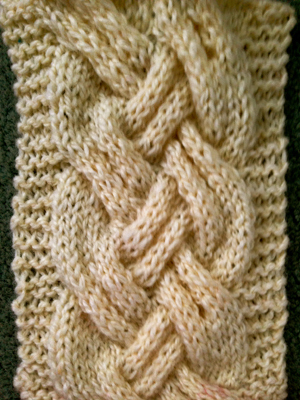 Reversible ribbed cables share the principle of like needing to land on like (knit on knit, purl on purl). 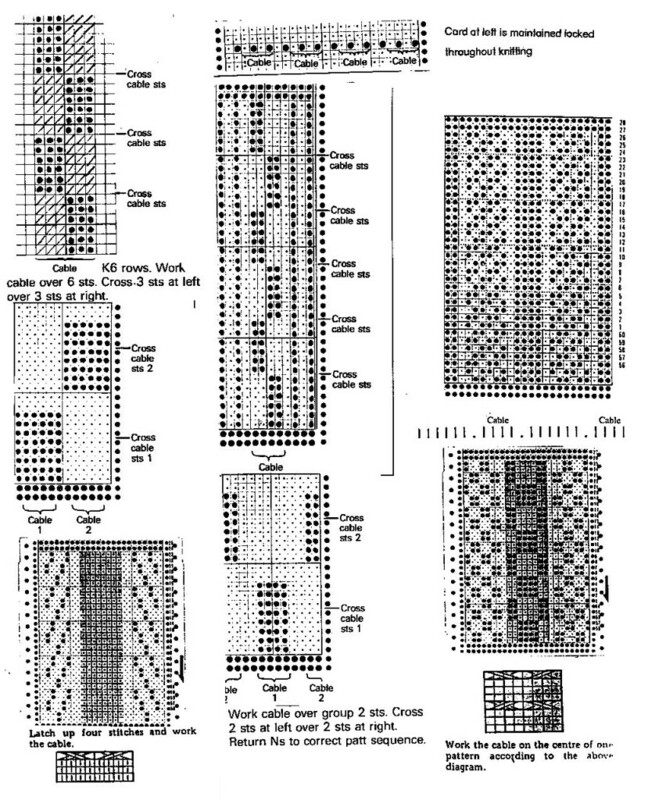 Starting out with a single row punched card, mylar, or program repeat, with the card locked, provides a quick test for tension, keeping track of patterns, etc. There are many, so at least initially, cabling on a constant number of rows apart, may help avoid errors. Using two beds is the obvious means of creating a purl ground in combination with your cables, it will be addressed in later posts. 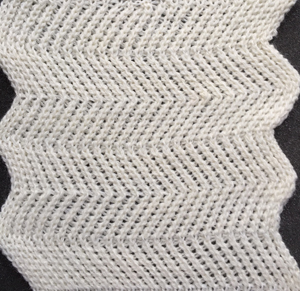 If you are trying to cable more than 4 stitches on the main bed, using the ribber to provide extra yarn for the cross over may solve problems in accomplishing the cross. The ribber needs to be set at half pitch the row before the cables. 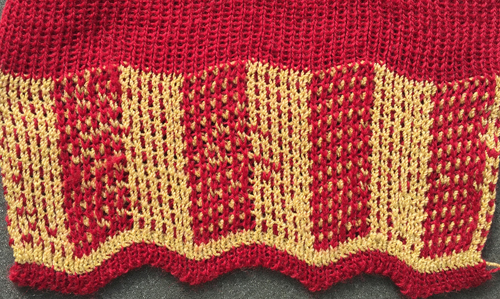 Needles on the ribber are kept out of work until that row, pushed up to work position, and the row is knit. The loops formed on those needles are then dropped off, the ribber needles are put out of work, and the cables are crossed. The main bed knits until the next row before the cable crossings are once again due. I have recently begun to use water-soluble markers to mark needles positions on metal beds clearly for help in keeping track of locations for specific manipulations. 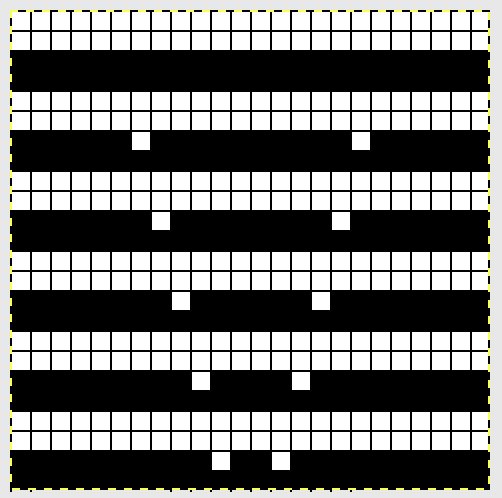 Below is a revision of a punchcard used in a previous post to track crossings for 3X3 cables, with punched holes added, taking into consideration locations for picking up extra yarn on the ribber. After 2 needles are selected on the main bed, one needle on the ribber on either side of them is brought into work. 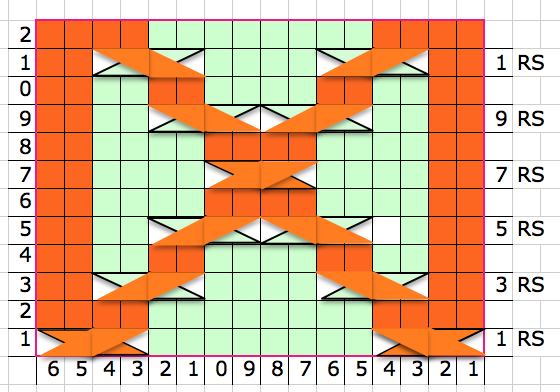 As the carriages knit across, the ribber needles pick up loops, while 6 needles are selected indicating the location of the cable cross on the next row. Ribber loops are dropped, and the needles creating them are returned to out of work position. The cable stitches are then crossed, and knitting resumes, continuing until needle selection once again indicates that an action is required. An alternative solution: reverse the beds, with the ribber doing the knitting. A card may then be drawn to select needles for picking up those extra loops, now on the main bed. 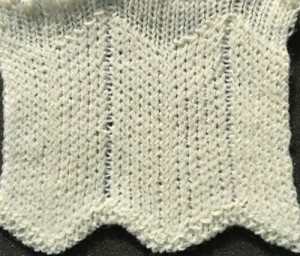 The knit carriage is set to slip throughout. 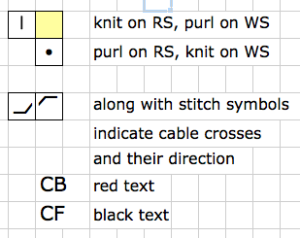 Punched holes (or programmed pixels in downloads, black squares in mylars) will preselect in Brother KMs, not only keeping the needle selection error free, but also tracking rows knit between cable crosses being made. Brother ribbers tend to knit more tightly than main beds, so tensions will require adjustment as well. 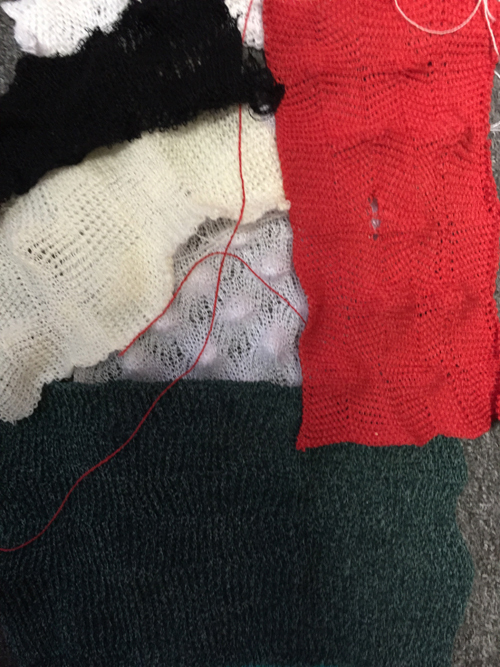 With a bit of planning ahead and doing some “air” knitting, all needles not involved in picking up the extra yarn may be noted and placed out of work. Only the needles for selection will remain in work, thus making it easier drop the loops formed on them during knitting. 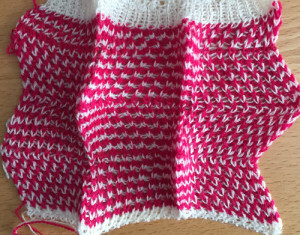 This method allows for creating the cables while retaining a somewhat tighter tension. Since the ribber carriage has no wheels or brushes to help hold the knit in place, weight must be used. Too much of it will lead to more frequently dropped stitches. 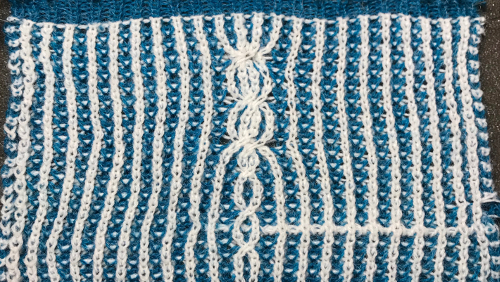 It is always good to bring cable group stitches out to holding (E) in order to visually check that transfers have occurred properly, and that there are no dropped stitches before continuing to knit. The first repeat below is for a vertical cable panel 24 stitches wide, 12 rows high (2 repeats shown); within the repeat, odd rows are all knit, even rows are all purl. Colors are indicative of cable crossings. 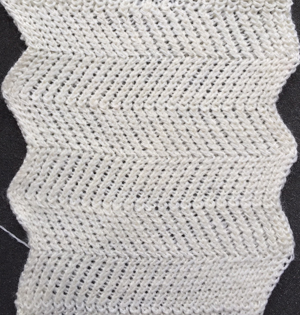 Borders in swatch, or area in between multiple vertical panels, may be worked as 1. purl on even numbered rows, knit on odd numbered rows to create a purl ground behind the cables on the “right side”, or 2. knit every row for garter stitch in same areas. Abbreviations : RS: right side, WS: wrong side. CF and CB indicate where the cable needle (CN) is held during the process. 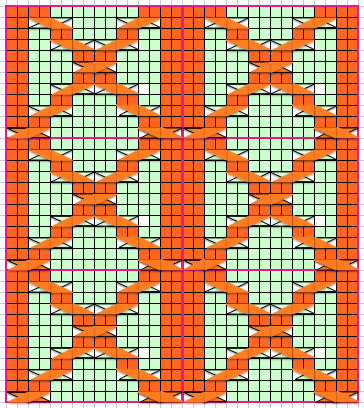 Dotted borders in chart outline columns 3 stitches wide; all cables in sample are 3X3 crosses. If patterns are for publication in specific venues, conventions in symbols may or should have to be observed. To keep track of personal projects we often differ in what format or shorthand makes the most sense to us. If the like of the above result appeals to you, I am sharing a workbook with pertaining puzzle pieces. I find working at 200% magnification is the easiest for me, that may be easily changed to suit. 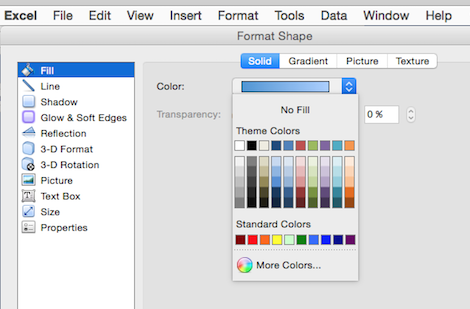 PS: My working palette in the original document was as seen in the images above. You may find some of the colors will be different in your download, depending on your computer. I have read on other sites in the past that the color change can be an issue in excel knit charting downloads. The image below reflects such a change. 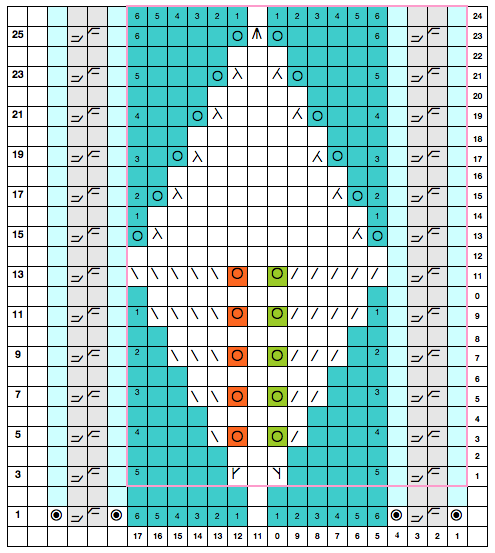 It is a quick capture of part of the chart when I tested the download myself. 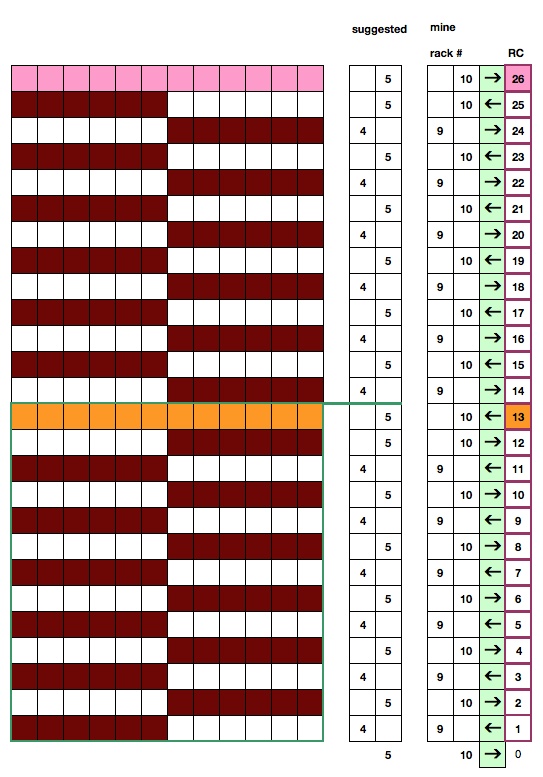 The large color blocks are the ones affected, and may be easily changed to match the cable crossing colors. In the past I have suggested methods for working in Excel, and provided links to excellent material shared by others online. Of late I became interested in using the program to produce simple color graphics for cable illustrations. 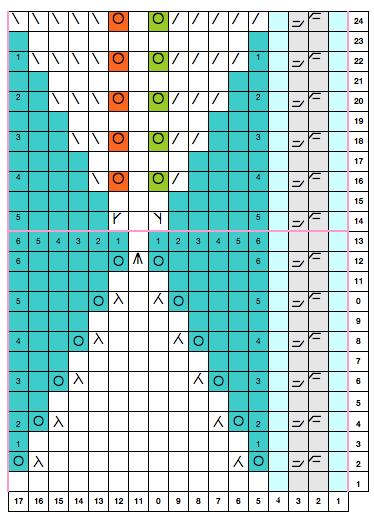 It is helpful to have prior experience in using Excel for knit charting. This is not intended as a complete tutorial. I am providing a document for experimentation. 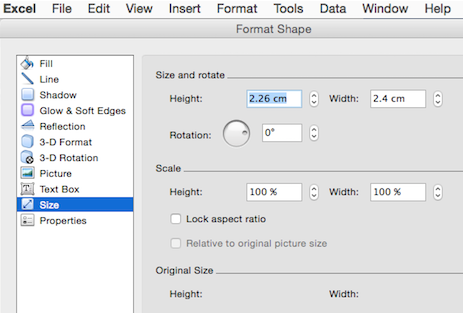 I would suggest copying and pasting the individual shapes to a different part of the document before playing with color changes, resizing, etc. 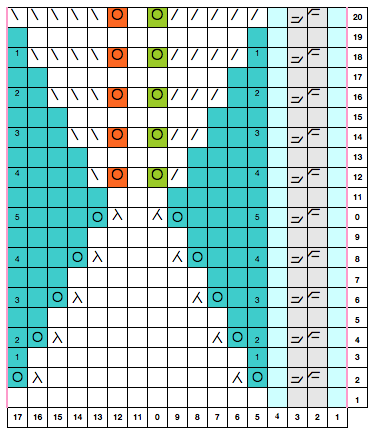 This may be done within the chart in progress, or separately, and then copying /pasting or moving the final result into place. 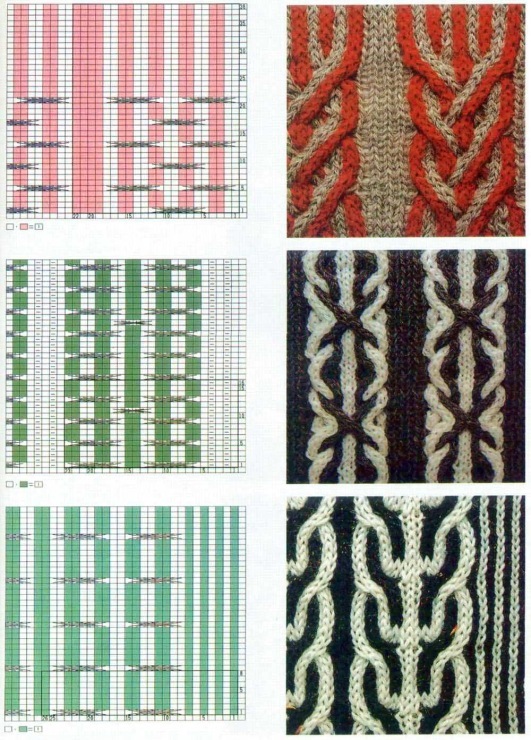 The resulting charts may be used in both hand and machine knitting. 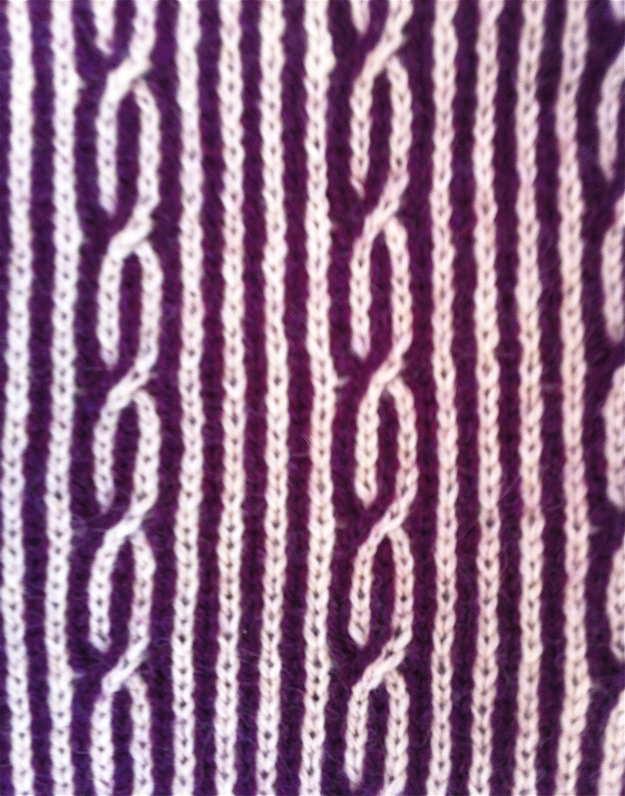 My illustrations here are intended for machine knits, so they do not combine purls and knits on their ground. 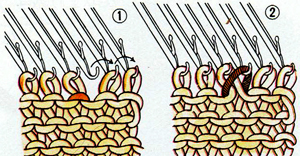 Images represent single side view: as they would appear on the knit side facing hand knitters, or the purl side facing the machine knitter. 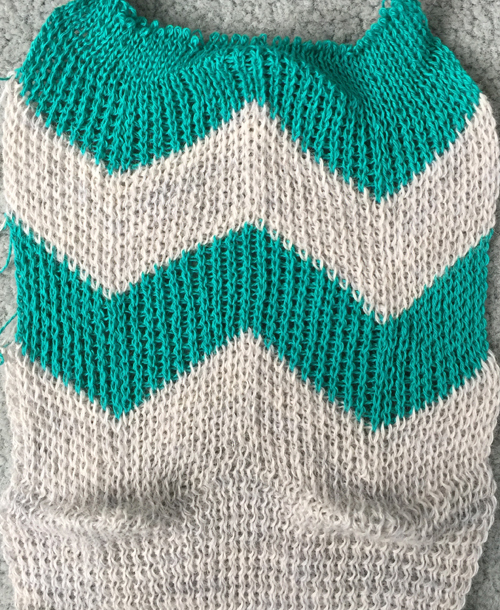 Stitch, row marking, and text may be added as wanted. Chosen from the view menu, the object palette allows selection of built in available shapes. Once a shape is drawn into the workbook, the formatting palette allows access to image size, rotation (including flipping both vertically and horizontally, and alignment (moving front to back and reverse). an in progress document for experimentation: blog_color_cables. 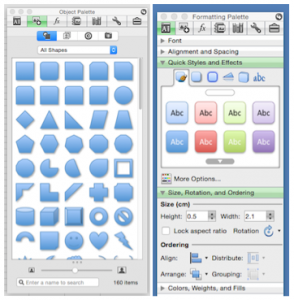 Adjust zoom to personal preference for either viewing or working, grab portions of working screen for images of sections of workbook to save, or save as, and explore PDF options.